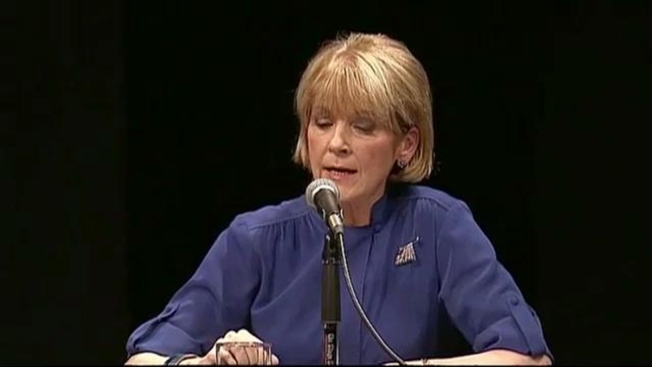 The five candidates seeking to become the state's next governor squared off in their first televised debate in western Massachusetts on Monday with Democrat Martha Coakley and Republican Charlie Baker working to draw sharper distinctions between their candidacies. Baker said that while he supports targeted investments in early childhood education, it's equally important to have good schools so children don't lose any early advantage as they advance to higher grades. "Given what Charlie Baker said tonight, I'm surprised he doesn't support the gas tax," Coakley said. "They need to know what the plan is and they need to hold the public officials who develop that plan accountable," Baker said. Both criticized the lengthy rollout of the state's marijuana medical dispensaries and said the state should continue to invest in public higher education. Baker said the state should also look at other higher education options like offering three-year degrees. One dramatic moment came during a question on state infrastructure spending when Lively, a pastor and anti-gay rights activist, talked about the declining "moral infrastructure" in the state, citing the promotion of "sexual perversion to children in the public schools." "As the brother of a gay man who lives and is married in Massachusetts, I want you to know that I found that kind of offensive, and I would appreciate you not saying things like that from this point forward," Baker said. "I believe in the Bible, Charlie. I'm sorry that you don't," Lively responded. Recent polling has suggested a tight race between Baker, who ran unsuccessfully against Gov. Deval Patrick four years ago, and Coakley, the state's attorney general who lost a U.S. Senate race to Republican Scott Brown in 2010. Earlier in the day, Baker offered an alternative version of an earned sick-time proposal that will go before voters in November, while Coakley proposed a series of ideas that she said would strengthen the state's innovation economy, including doubling the number of paid internships supported by the state in the life sciences, clean energy and technology sectors.